I was in Rockhall, MD to paint these two watercolors. The sketches and preliminary drawings shown below were done on site and the two paintings were completed in studio. I was stunned by the beauty and vastness of the property when I arrived. So quiet and serene. Sometimes it is overwhelming of what to portray. Luckily there were two paintings to be completed, but honestly, I could have painted many more beautiful scenes in this location. “Napley Green” watercolors were commissioned gifts to the property owners. It is often more time consuming to paint a commission because you want it to be exactly what the person had in mind. So that equals a bit of corespondence back and forth. You take extra care in planning and executing, all the while hoping it will meet expectations. I’m happy to say the recipients were thrilled. What a fabulous gift from their friends. The framed painting size was 23w x 18h. Plein Air watercolor “Lake Mary Elmer” depicts a peaceful day of painting in mid August. Lake Mary Elmer is part of the ecologically important Cohansey river. The Annual Riverfest competition is sponsored by Cumberland County Cultural and Heritage Commission and Gallery 50 in Bridgeton, NJ. The exhibit runs through the end of September. This painting is available and can be shipped framed or unframed. Matted to fit an 11 x 14 inch frame. I love being where the sky meets the ocean. Throughout the day, nature puts on a show. Often, I cannot leave till the last bit of light fades away. “Solo Flight” watercolor received People’s Choice award in the Nature and The Landscape competition at Gallery 50 in Bridgeton, NJ. What a thrill it is to hear your name announced! Thank you to everyone who voted for this painting. Nature and The Landscape exhibit runs through the end of September. What a great way to spread art through a community. My watercolor “Moods Farm” was one of 30 selected artworks to be included in the annual Pitman Art Stroll. Each banner hanging in town is printed with the artwork and a little bio from each artist. The originals are on exhibit at Pitman Gallery till the end of September. Great fun! Great event! Great gallery, check it out! “Moods Farm” watercolor depicts an icon in Southern New Jersey. I wanted to capture the beautiful colors to be found at this farm stand. It is apple and pumpkin picking season, so stop by and get a few. Artist’s Day in Mauricetown, NJ resulted in “Green Shutters” watercolor. This historic seafaring town sits along the Maurice River. Every year Mauricetown Historical Society and Cumberland County Cultural and Heritage Commission host this get-together for artists and the community. I had the pleasure of painting with other artists while listening to live bluegrass music on a brilliantly sunny day. My watercolor sketch of “The Snake Brothers Band” is below. Great fun talking with everyone who stopped by to check out the art in progress! You can’t beat South Beach for aqua blue water and an ever changing sky. Best way to play in the sand! This was painted last February at the southern end of South Pointe Park beach in Miami, FL. “Sky, Sand, Ocean” watercolor is available framed or unframed, inquiries to mucciyvonne@yahoo.com ©Yvonne Pecor Mucci, all rights reserved. You know the famous movie scene, well, still a great subject to paint. Having a little fun painting a street scene as a progressive demo in my last workshop. Cityscapes and figures are always a challenge to paint. Simplifying the abundance of signage was key. NYC is bustling no matter what part of town you find yourself. This storefront caught my eye mostly because of the way the light was casting shadows, but also because of the contrast in the shop name to the busy street. I tried to play up the red stop hand in the crossing light as if it was beaconing one to stop in and have a little cupcake. During my last workshop, it was requested to paint a street scene with figures, so this scene was my first thought since I felt so strongly about it when I photographed it. Inquiries to mucciyvonne@yahoo.com ©Yvonne Pecor Mucci, all rights reserved. “Workyard” was painted during the annual Artists’ Day In Mauricetown. This is an amazing little historical town with lots of great painting subjects within a few blocks. The day was hot, but the bluegrass music was cool and so were the locals strolling around to check out all the artwork being created. Can’t wait to get back there this summer! ©Yvonne Pecor Mucci, all rights reserved. I had a wonderful fall day painting the meadow at Longwood Gardens with my friend and fellow artist George Gallatig. This location is exceptional because the color continually changes. It truly is a magical place. In the spring I want to return and paint a larger version. The photos below show just how beautiful this location is in the fall. On my easel is a small red plexiglass from Annie Strack which helps one see values when painting. This watercolor is available unframed 12 x 9, or framed to 14 x 11 and can be shipped. Inquiries to mucciyvonne@yahoo.com ©Yvonne Pecor Mucci, all rights reserved. Painting snow is challenging because it is not white. Strong shadows make the scene come alive. Very little of the white paper has been reserved. The block-in below shows how much color is laid down in the first stages. The snow becomes white as you add stronger darks. “Winter’s Thaw” watercolor depicts a little creek that runs a block from my home. This painting is available and can be shipped unframed 12 x 17, or framed 18 x 23). Inquiries to mucciyvonne@yahoo.com ©Yvonne Pecor Mucci, all rights reserved. This past summer I sat on a bench in Central Park and painted this study of Pine Bank Arch Bridge. It is cast iron, and one of my favorites. My plan is to do a half sheet of this subject in plein air over several days. For the past few years I’ve painted en plein air at Royal Port Antiques in Salem, NJ. “Rusty Memories” watercolor depicts one of the many antiques sitting on their porch. It was sketched on site and finished as a progressive demo for one of my workshops. Painted on the last day of Plein Air Brandywine Valley during the exhibition at Winterthur. Across the meadow at Winterthur you can see these trees in contrast to each other. Can’t you picture Christopher Robin and Pooh bouncing over that hill? This was a nice way to end a really great week of painting. Thank you to everyone who made all the details come together! The stone arch bridge shown above was painted at Winterthur during the Brandywine Plein Air exhibition. I loved the fall colors reflecting in the water. Great day painting and talking about all of the beautiful locations included in this competition. These wonderful colors will be replaced with snow, and I may have to trek out there and capture another season! Hate to wait a whole year for the next Plein Air Brandywine Valley Competition! This painting is available and I’d be happy to ship or deliver. “What are all those people doing?” was the general conversation of people passing by. This was nocturnal painting at Chesapeake City, MD with Plein Air Brandywine Valley competition. Give artists a 6pm start time, a few led lights hanging off their easels, and see what they come up with. Some race to catch that twilight color, while others wait till it gets really dark. Crazy, challenging, and fun are nocturne competitions. You have to know how to mix vibrant darks, if you don’t, you’ll learn really fast! Another perfect day at Chesapeake City, MD with Plein Air Brandywine Valley. Throughout this picturesque town, one could find artists everywhere. I spent the day close to the Bayard House and loved every minute both painting and chatting with people stopping by to see the painting progress. With the bridge so prominent, you’d think that too many paintings would look the same, but they weren’t even close. Love seeing everyone’s interpretation of this waterfront town. “Last Light” watercolor was a quick draw for the Plein Air Brandywine Valley competition. It started at 4pm, so the light was fading. It is a big challenge for me to capture a moment in two hours, including framing. During these quick draw competitions the time goes by in a flash and you rely on skills you hope will be there when you need them! You take a deep breath, start throwing on paint and remind yourself that this is the very best you can do on that day. Crazy, but I would not miss participating! Below is the thumbnail sketch I did before the Quick Draw start. These handy little sketch books were compliments of Jerry’s Artarama in Wilmington, DE. I used mine all week! Thank you to Annie Strack who procured the samples and put together swag bags for the painters. I was one of many artists painting the historic homes sitting along Strasburg Road as part of the Plein Air Brandywine Valley competition. “Garden View” watercolor depicts a 1760s home in Marshalton, PA which was painted on the second day of the competition. The homeowners were so gracious and accommodating! I’d love to get back there again to paint more of these historic buildings. “Indian Summer at Haskell’s” watercolor was painted during the Plein Air Brandywine Valley competition which benefits Children’s Beach House. I appreciate being one of 75 artists capturing the idyllic scenes of the Brandywine Valley during a week of perfect weather! The location was inspiring with a combination of green silos and stone walls in this functioning farm. It had everything an artist could wish for in a subject. Thank you to the Haskell Farm for opening up their property during this event. This painting was sold during the Gala held at Winterthur Museum & Gardens. My gear is packed and I am ready to paint! I look forward to participating in Plein Air Brandywine Valley all year! Amazing locations! Great weather! Great cause! “Reflections” watercolor was painted during a plein air outing to Greenwich Lake with Gloucester County Art League. When the sky is a bit gray, the color can be more vibrant than on a sunny day. Everything was so lush that day. Weather usually doesn’t stop plein air painters, unless it is pouring, from painting on location. Plus you get to spend the day outside! I plan on getting back to this location when the fall colors are in full bloom to do a larger version. “Reflections” is matted and framed to 14 x 11. 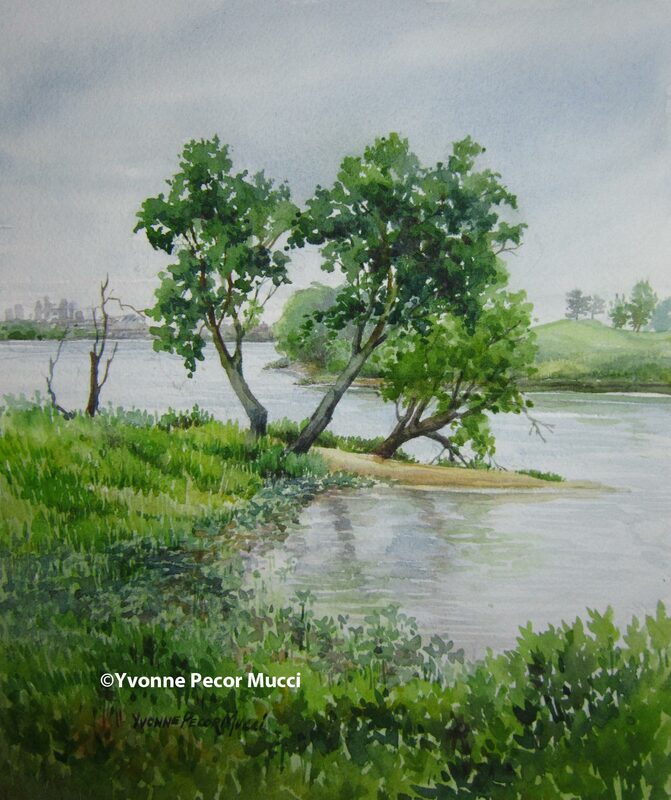 “Approaching” watercolor is a view of the Delaware river. It was late in the day which made the colors more intense. This painting was started as a demonstration for Salem County Art League and finished in studio. It was a great example of how to exaggerate a watercolor bloom to show heaviness in the clouds of the approaching storm. We’re coming into fall, with it’s bursting color. Next week is Plein Air Brandywine Valley, an exciting event showcasing 80 artists. Can’t wait! This watercolor was displayed in Gallery 50’s Nature and The Landscape exhibit. “Approaching” inquiries to mucciyvonne@yahoo.com. It is matted and framed to 16 x 20. Shipping is available. “Hanging Out” watercolor depicts the Cohansey river in southern New Jersey. I tried to portray the sweeping sky along with the flow of the river. This painting was exhibited during Gallery 50’s Nature and the Landscape exhibit. Matted and framed to 19 x 25. “Letters” watercolor was painted at Royal Port Antiques in Salem, NJ. Owners Suzanne and Michael host Salem County Art League during the Arts-In-Bloom studio tour. Everywhere you look is staged with beautiful antiques. Great day of painting on location.